Two women - one a fiery teenager, the other a cantankerous octogenarian - find their mutual antipathy blossoms into an unlikely friendship in this heart-felt multigenerational story about finding a kindred spirit where you least expect it. 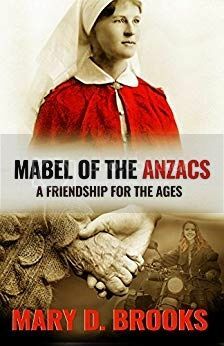 Zoe Lambros meets Mabel Andrews, a mercurial, cantankerous World War I Australian nurse. Zoe's introduction to the fiery octogenarian is an explosive mix of sound and fury. Neither woman wants to give ground and they are determined to be proven right. For Zoe, actions speak louder than words and she sets out to uncover the enigma that is Mabel Andrews. Mabel discovers a kindred spirit that leads to an unlikely friendship. Together the two women forge a close bond that will change their lives forever. It's a friendship for the ages..
Mary D. Brooks is a geek with too many imaginary friends who speak different languages (knew those language classes would come in handy). She is a historical romance and urban fantasy storyteller and addicted to stories and song about strength and courage. Mary plays well with others (for an introvert) but then retreats to talk and write about her imaginary friends. She is passionate about lots of things that inspire the mind (art/design, psychology, science and tech) and that sets her muse on fire (she’s a busy lady! ).